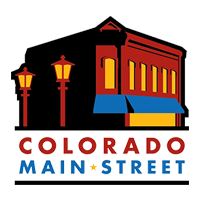 If you have driven through the heart of Wellington recently, you may have noticed the latest downtown beautification projects brought to you by the local Main Street program. 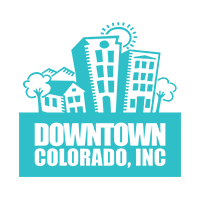 The Wellington CO Main Streets Program is a nonprofit organization with a mission to promote, enhance, and develop downtown Wellington for the benefit of its inhabitants, businesses and visitors. The organization’s design committee, headed up by Karin Chapman, is in charge of the various downtown beautification efforts. The flower planters, streetside banners, bike racks, and 2017 Christmas Decorations, are all projects that came out of the design committee. 2018 is the summer for bringing art work and murals to downtown Wellington. These projects are funded by a variety of sources, including grant funding, sponsorships and donations, and collaboration with the town and downtown business owners. The mural on the Sol De Jalisco building was completed in early August. Joe Hamman, who grew up in Wellington and is now a fine arts major at Lesley University in Cambridge MA, was home for the summer visiting his father, Mayor Troy Hamman, when he volunteered his time to paint a mural. Commercial Coatings Inc. donated all the paint and materials for the project. The owners of Sol De Jalisco, Myrna and Jesus Rodriguez, offered up the east wall of their restaurant for the painting. The WCMSP design committee helped come up with the final design for the mural, deciding on something that went well with the restaurant theme, as well as adding color and vibrancy to downtown Wellington. Joe had the help of his girlfriend Maddie Reiber, his sister Grace Hamman, and his father Troy, as the family worked together to complete the mural over a two week timespan. The piece, named ‘In Bloom’ was done with Acrylic Latex on Stucco, and is Wellington’s first official mural. In later August, the Wellington Town Hall building got a face lift with the addition of a unique piece of outdoor fine art. “Our Home on The Front Range” is a 7’ x 16’ Acrylic painting on four aluminum panels, and is truly one of a kind. This is considered fine art rather than a mural because this painting can be moved. This piece was done by local artist Shandy Staab-Daubert of Shandy O’s Fine Art. Shandy is a schooled artist by trade, exhibiting and selling works throughout the country. Shandy’s love of Wellington served her well in the creation of this original piece of fine art depicting our local landscape and peaceful home on the front range. To learn more about Shandy and see more of her work, visit her website at shandyos.com. Dynamic Image, of Wellington, designed the panels for the painting, and installed the panels once the painting was complete. This project began in 2016, with the design committee, and has been a long-awaited addition to our downtown. 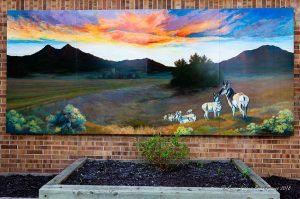 We are excited to have this unique piece in Wellington, it may be the biggest piece of outdoor fine art in Colorado! The Wellington Main Streets Program Design Committee is working with other building owners and ideas for future mural projects. We are excited to do some murals related to the history of downtown Wellington. 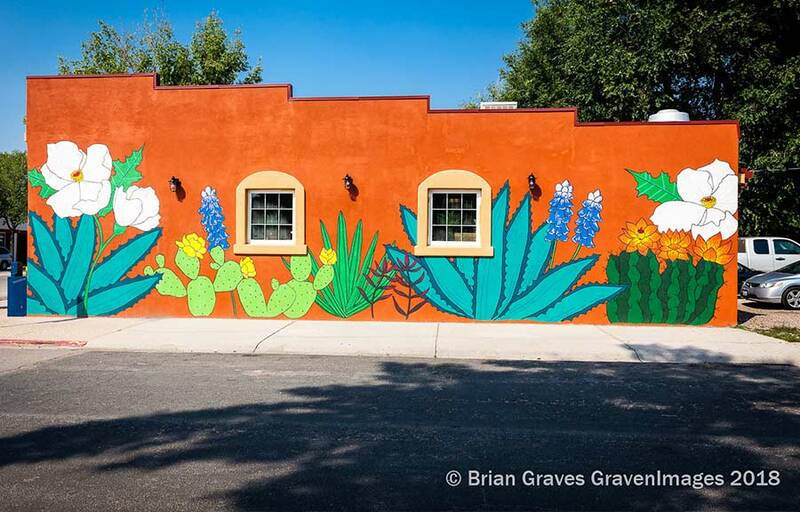 We encourage building owners to let us know if they would like a mural on their building, and local artists to let us know if they are interested in doing a mural. Next time you visit downtown Wellington, make sure to stop and see the results of these two downtown beautification projects!